::Wrapping:: Wednesday 23rd December 2009 at 11.10am in front of the fire. ::Happiness:: Grocery shopping done with Anth at 7am this morning, which was actually rather stress free and enjoyable. Sewing done. Dull,icy cold weather. Roaring fire. Anth's last day at work. Christmas music playing. All my children in the house. Thought of family arriving tomorrow. ::Relief:: Unbeknown to me as I wrote my blog post yesterday morning, Anth fell off his bike in front of a car on his way to work. Life could have changed for us all in just a few seconds and today could have been a very different day. Discovering a lot of naughtiness. 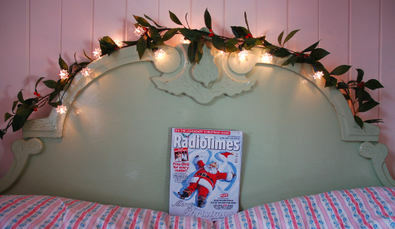 Ok, I will admit it....I've hung some plastic mistletoe in my corner; played some Christmas music the other day; and whilst I'm in confession mode, I can't bring myself to throw away the Christmas Radio Times either. Has it been and gone already? This year our Christmas has been rather different to our usual one. Due to unforeseen circumstances many things didn't get crossed off my ever growing list and.. well, the list had to go and I just had to deal with it. It made me think of how important I felt my 'role' of being 'the creator of Christmas magic' was. But in reality my family would rather see me with a smile on my face rather than me disappearing through the door trying to cross off another job on my list. And as I stood in the kitchen on Christmas Eve at 3pm (officially my favourite time of the year) still cleaning and rushing about - Carols at Kings College started and I just stopped what I was doing took a deep breath and gave thanks that I could meet that most loved moment with no real sadness in my life. And so our Christmas started, lacking in many of the details I had decided must be done, but certainly not lacking in warm, family cheer. This year we had some of our New Zealand family with us (our oh-so-grown-up niece and nephew and their partners) which was simply wonderful. They took it all in their stride the fact that I served up what I thought was Bucks Fizz on Christmas morning only to discover it was non-alcoholic and a year past it's use by date. And then 'forgot' to make the trifle because I spent far too long playing with my new toy! Oh, I'm such a lucky girl to have an iphone. Bless that husband of mine who agreed to me changing my mobile for this wonderful invention, even when we should be watching the pennies... I can't rate it highly enough and I can't keep my hands off it! So many things have been 'forgotten' because of what the family call my 'iphone moments'. But, it hasn't been all iphone love. No. 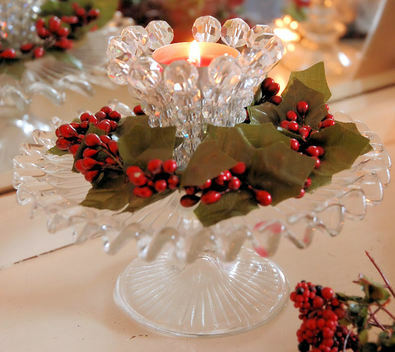 I started a new Christmas craft project especially to do in front of the fire (and if I'm honest, the Christmas TV!) this holiday. 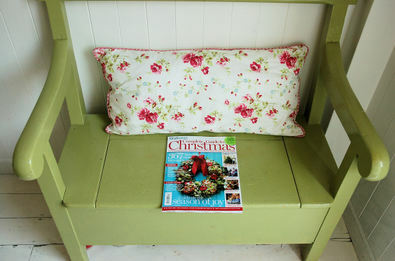 I saw in the December edition of Good Homes magazine a wonderful home of a lady called Nicki Trench. 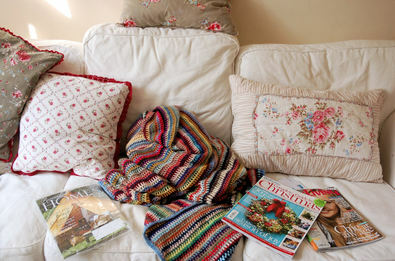 She had some round crochet cushions on her bed and knitted sofa which immediately caught my eye. 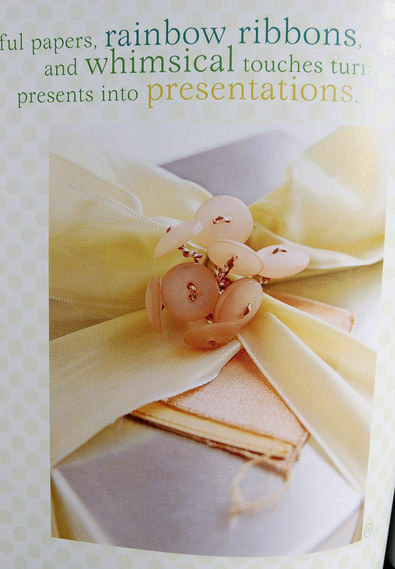 Hooray for magazines - more inspiration! access, I'll just have to do a quick search. That is after the New Year's Eve trifle has been made! 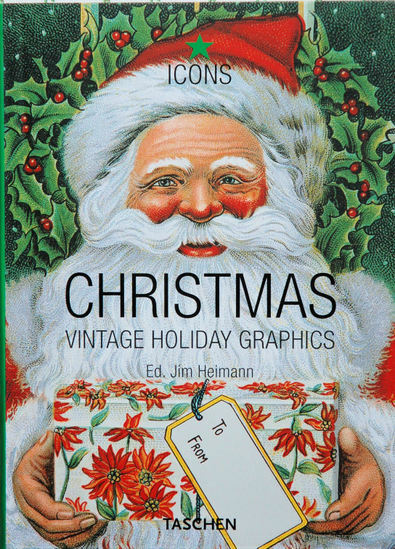 which is just full of what it says on the cover, vintage holiday graphics. 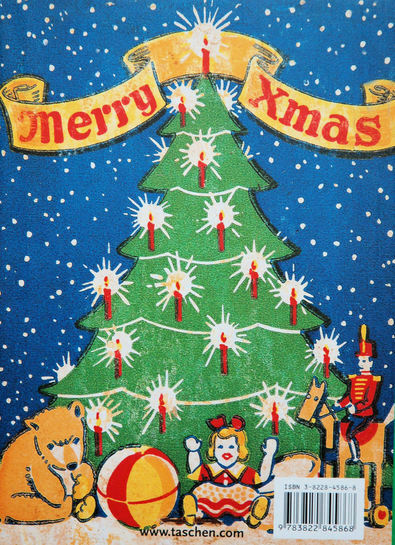 Only one complaint, and that is the picture on the back cover says Xmas - a word never used in the Goble household as we never take Christ out of Christmas! 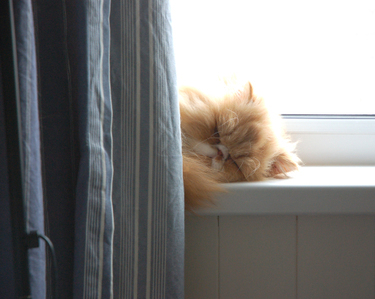 Today has been the first day I've had at home in nearly a week. 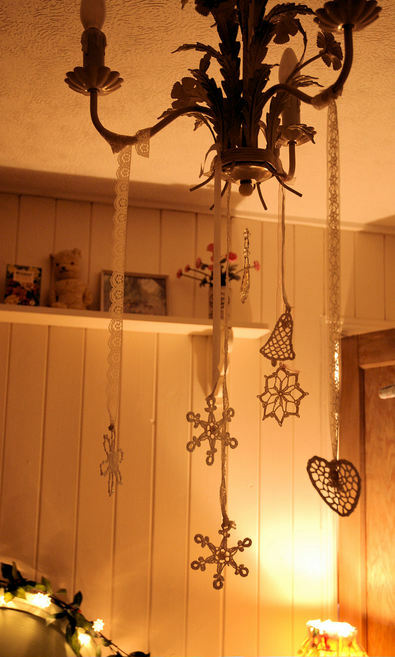 And during the last few days all I've been yearning to do is hang these crochet shapes from our chandelier in our bedroom! Funny that, how something so simple brings such anticipation. It's also the simple things that catch my eye and make me think ah, there's a good photo. Like my bag of fabric violets I bought yesterday. 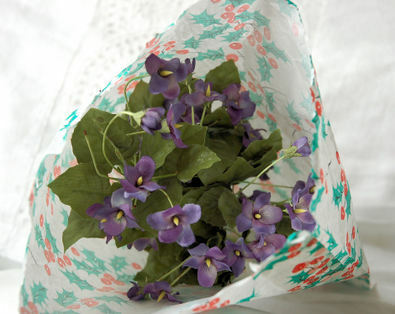 Violets in a holly patterned paper bag. The unexpected. 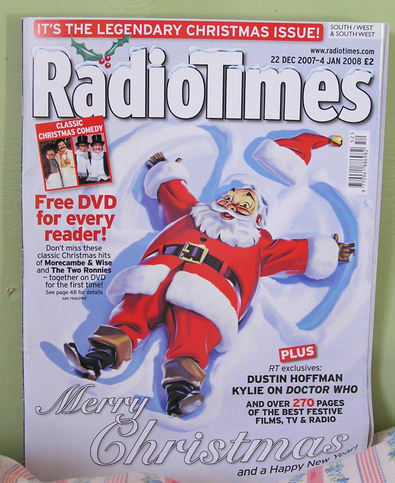 I'm not sure if you remember this post from last year; but another highlight of my year - probably #436 - is buying the Christmas double issue of the Radio Times. I just love it and eagerly await it's arrival wondering about the seasonal cover and what telly visual delights the festive season will bring. I go as far as writing the day of it's arrival in the shops on our calender causing comments like, "Jane, what does 'RT out' mean on the calender?" So imagine my disappointment when after reading that it was due out last Saturday I dashed to our corner shop in the most torrential rain (bringing not one but 2 plastic bags to keep it dry) only to discover, yet again, that it hadn't arrived. URRR! This happens every year..every year.. and I get a little desperate as I politely show the shop assistant the advertised date in the current issue. "Doesn't really matter what it says...we don't have it!" they say with a sniff. "Quick, come and line up, Farmer Christmas is watching you know!" 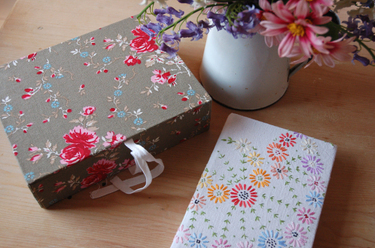 Thank you for all your wonderful comments about my flower sponges. I bought them from a shop in Totnes but they have a sticker on which says Foamulations Belmar, NJ 07719 USA. Hope that helps and I wish I could buy you all some. Goodness knows you all deserve it. Perhaps Farmer Christmas could help! I've been waiting and waiting and I knew it would be today. Well, I hoped it would, as the publishers said it would be today (should I actually confess to ringing the magazine a month ago?) 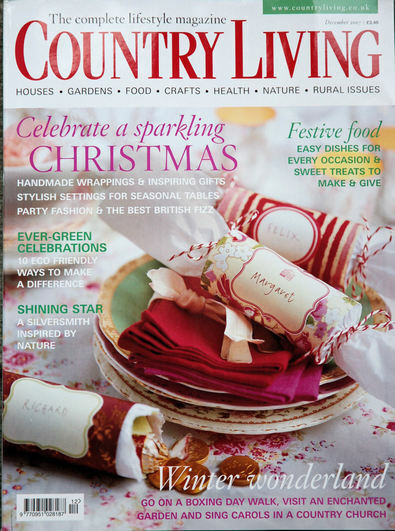 And it was today..the first of the Christmas magazines. I made my nest. Infact it was a good day for magazines as we had some mail. 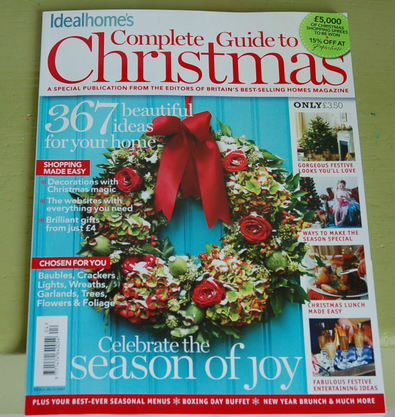 We have had a postal strike and I hadn't expected anything but there on the door mat lay my first copy of Romantic Homes (I have subscribed) and my Easy Living. 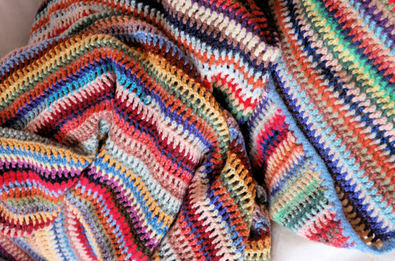 The blanket was one of 2 that I found in a charity shop on Saturday and cost only £3.50. 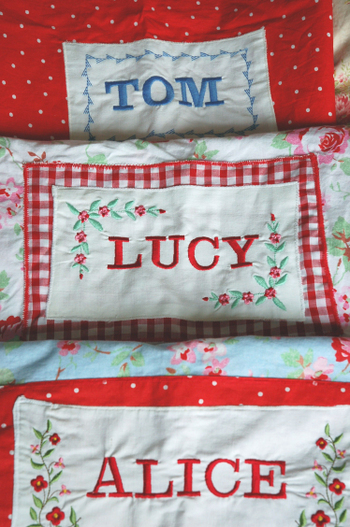 I never know how I should feel when I pick up handmade blankets and embroideries for only a few pounds or sometimes just a few pence. It doesn't feel right to have them change hands for so little when the time, effort and materials would have 'cost' much more. It makes me sad to see handmade things given so little value. But then I love a bargain and don't have too much spare cash so appreciate the low cost. 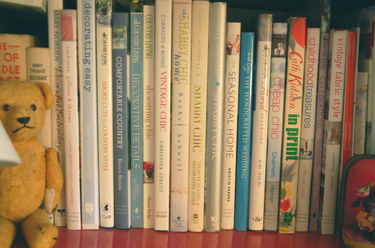 My guilt is somewhat appeased by the fact that each item has a loving place in our home where it begins a new life. It makes me smile to think most of the paraphernalia in our home has been owned before. We have small histories of many different people. I like that and often wonder about them. 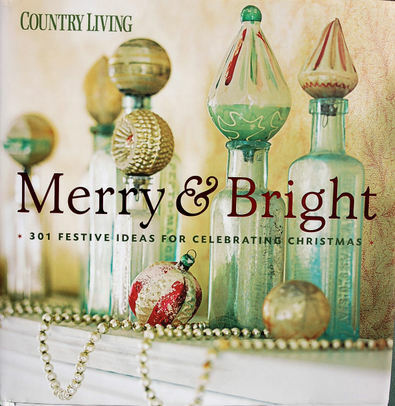 And I also like Christmas magazines...let the magazine season commence! 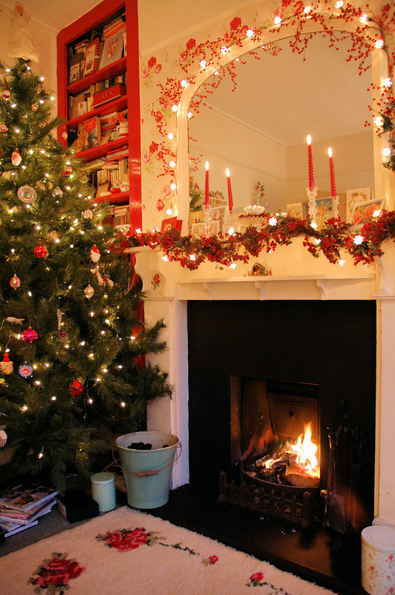 As I have mentioned before, I absolutely love Christmas Eve and for me there is nothing more perfect than family gathering together around the fire and the wonderful anticipation of what is to come. Our Christmas Eve started slightly differently with a trip to the emergency vet as poor little Alfie had been scratching his tummy a lot and now he was unable to sit still for very long. The vet found out that he had something to do with his skin (a big long word!) and gave him an injection to help until he could be treated in 2 weeks. Poor little chap. Anyway, we were ready for the family to arrive and when the Carols from Kings College, Cambridge started at 3pm I knew that Christmas had finally started. I even shed a small tear or two with the loveliness of it all as it is a moment that I wait for all year, but that is only between us! These are the children's stockings, well they're actually pillowcases. My friend has one of those very, very expensive sewing machines that embroiders and she did the names for me and the flowery bits. 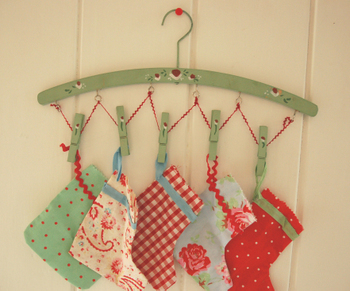 The children leave these by the fireplace ready for Father Christmas to come and fill them. 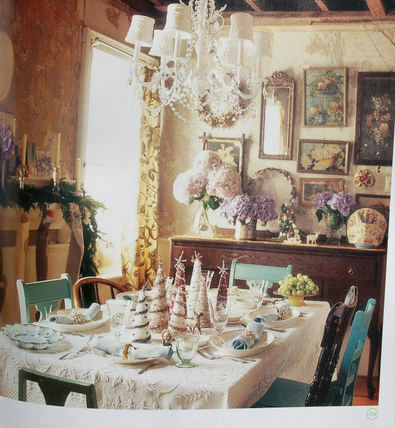 The next morning, nobody is allowed into the sittingroom until everybody is up and can share the wondrous moment. Even Posy and Alfie were given a toy. We had a lovely day and everyone did their own bit to contribute to the day in some way. 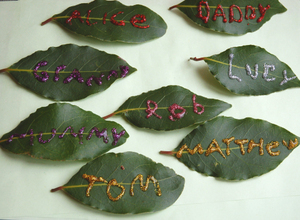 I particularly loved Alice's place name 'cards' for the lunch table. 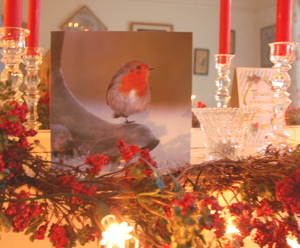 ...it was a lovely card with a gorgeous robin on it and inside he had put a £5 note and written.."Dear Mum, I thought you would like this card! Just to say I couldn't find you a present so I got you this instead. I love you very much and appreciate you organising Christmas, Love Tom P.S Sorry about my bad handwriting I have cold hands." In an instant I knew that it had been worth every last stressful moment and that I would do it all over again next year....only this time I'm starting in August! 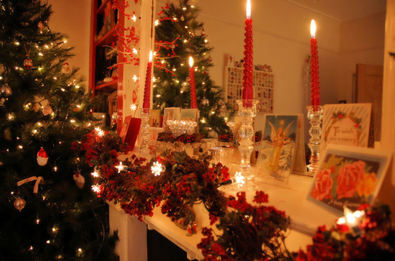 It's nearly upon us now and the house is looking more calm and festive. 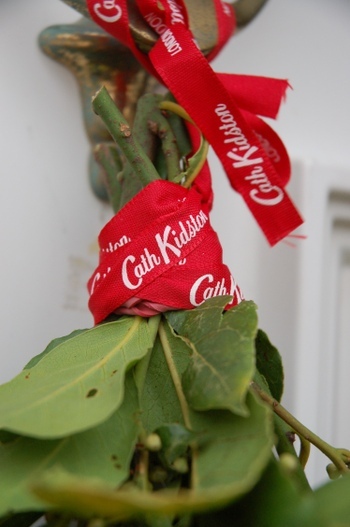 We are expecting Mum, Robin and Matthew tomorrow and just in case they wonder if they have come to the right house I have tied my bay wreath (well, it's hardly a wreath but a bunch of bay leaves from our ginormous bay tree) with Cath Kidston ribbon! I have even found time to go on a 'charity run' (no..not actual running! Me, run! More a case of doing every charity shop in the town!) 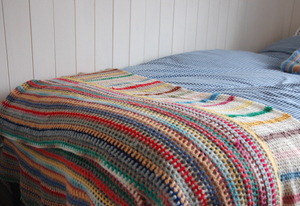 and I found this wonderful crochet blanket for Tom's room. Though he is not too happy about it, it hasn't been removed yet so here's hoping he secretly loves it. It is just so vintage as I explained to him but he says it is just sooo sad... 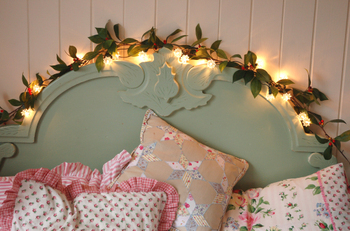 Even our bed has had a festive makeover. Tomorrow, is my most favourite day of the year. Isn't the anticipation so much better than the actual event. Well, that's what I find. 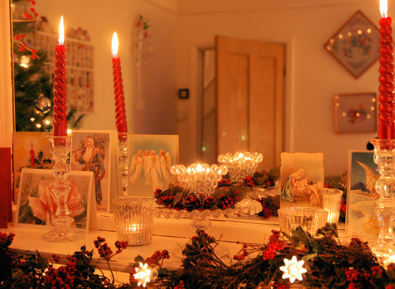 There is something so magical about Christmas Eve. I hope you enjoy yours. Let it snow, Let it snow..please! The scene is almost set (can I ever be 'ready'?) Apologies for the blurry photo. My camera and I are falling out of love as it keeps misbehaving (or more like I don't know how to use it properly!) anyhow you can get the fuzzy picture! The tree was put up, (finally..) yesterday afternoon. The children made it to Lapland but I must be the worst mother in the world or perhaps the only mother in the world that sends her children off to Lapland without a coat! I hardly slept with worry on Friday night but all was well and they had a magical time. I will ask them to blog about it themselves. I love bringing out all my favourite decorations each year. 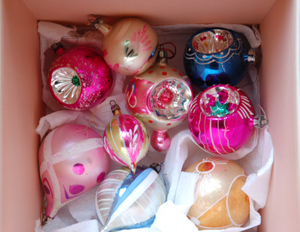 About 3 years ago I fell in love with vintage baubles, and started collecting them. I scour everywhere for them and now our tree has nothing but vintage. Well almost, I do have these.. 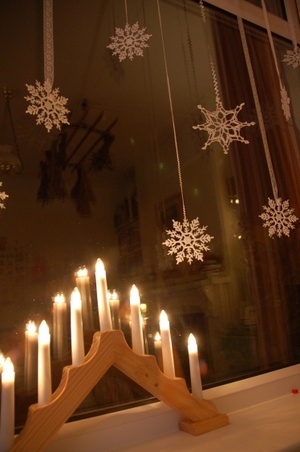 In the dining room at the front of the house I have hung white stars (some crochet ones) with white lace, ribbon or ric rac. I just really, really wish that I lived in a snowy climate. I read people's blogs who are almost waist high in snow (well sometimes!) 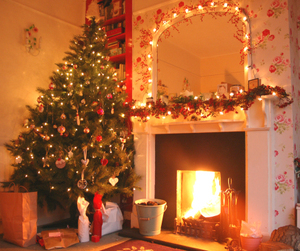 and I ache with longing as that is how I feel Christmas should be. So spare a thought for me when some of you are looking out over your winter wonderland...and if you listen hard enough you will hear me singing (pleading) from mild, wet Devon..'Let It Snow, Let It Snow, Let It Snow! ..all is calm, all is bright. 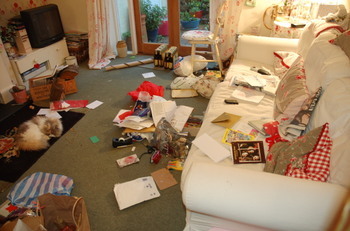 A view of our sittingroom, 5 minutes ago. 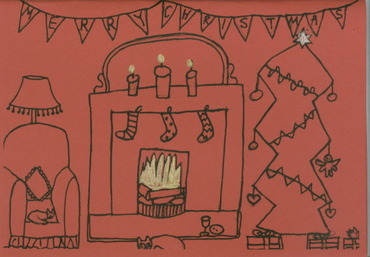 No tree, half decorated mantlepiece, no cards done, nothing posted...I could go on and on! 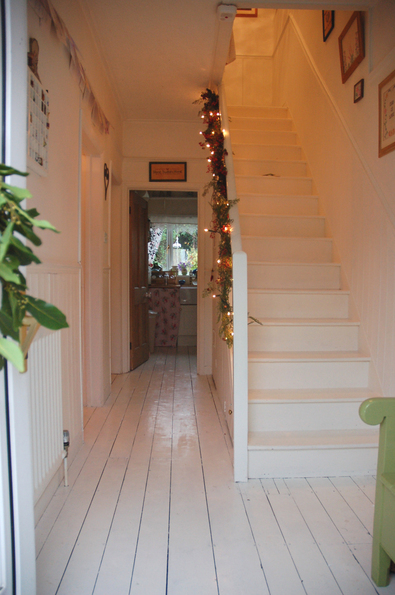 I would like to tell you that this is the only room with work in progress but no, you can hardly walk down our hall or even enter the un-wreathed front door! But watch this space, the children are off to Lapland today (Alice is better but has no voice) so I may get a chance to put the tree up before our visit to Cambourne (near Lands End) tomorrow! It's all go in the Goble house..or not! ..these are some of the earlier ones (circa 1990's) though there are a few missing. 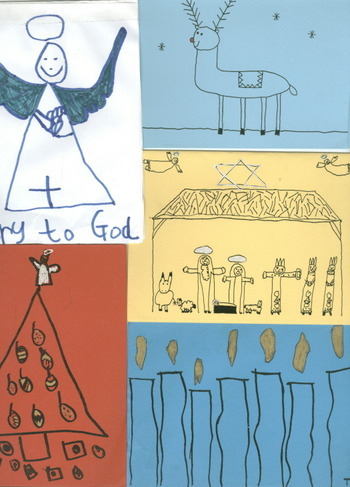 The very first one Tom did was a circle with legs, eyes and mouth who was meant to be baby Jesus! I've searched high and low but can't find it. 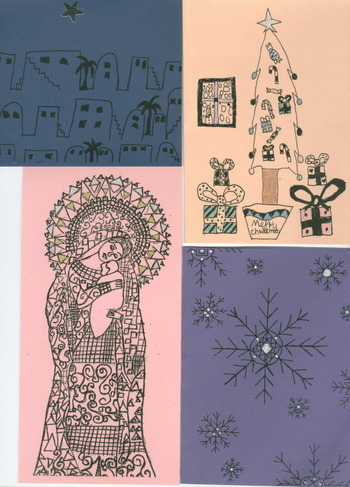 I am always surprised when we hear that people keep them year after year and one or two people have been inspired to start their own card making tradition. I like that! The season of Advent is finally upon us and I am glad, though I have waves of rising panic washing over me already as I had hoped that I would have learned from previous years and not have left things to the last 2 weeks. I always start to hyperventilate and my voice raises an octave or two as I desperately try and remember all the 'How To Keep The Stress Out Of Christmas' articles that I have read in my numerous magazines in the unlikely case that I might hit on some magic formula that will transform me into the all singing and dancing Mummy I would like to be and not the one that I seem to become. 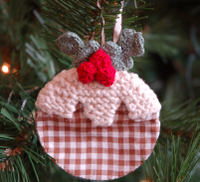 Do I really want my children's Christmas memories to be of a mother running around in a vile mood because I decided to make everything myself? Umm... Though I keep saying, 'I'll be OK when I have just finished such & such' but I don't seem able to finish such & such! 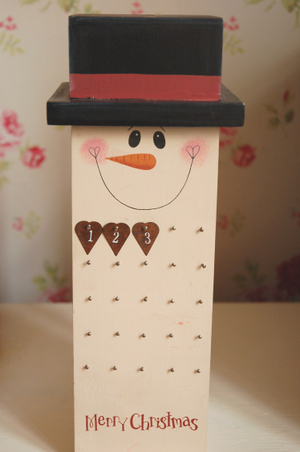 The photo is of the children's advent calender - well we use it as a Advent calender. I saw one like it a few years ago in a magazine (where else!) and copied it. I have yet to fill it with sweets (see how unorganised I am). 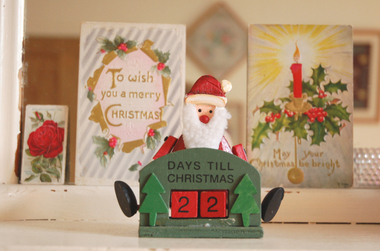 Granny always sends us Advent calenders - not the vile chocolate cartoon type but the lovely old fashioned type. 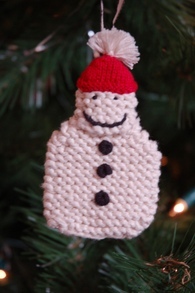 We also have the Snowman. We also have a Advent candle but that usually gets forgotten to be blown out and we suddenly realise we are at the 19th of December so it just sits for days waiting for the 19th and then I forget to light it! How do you start your countdown?